The Florida Restaurant & Lodging Association Educational Foundation (FRLAEF) supports Florida’s ProStart and HTMP programs. To be considered a ProStart program in Florida, the program must be using Foundations of Restaurant Management & Culinary Arts textbooks during the current school year. The information below and the opportunities included in NewsBites are only available to current ProStart instructors. This page is specifically designed for new Florida ProStart teachers so they can have all of the materials in one place. Please let us know if there is anything we can add to this information. PROSTART PROGRAM The ProStart program utilizes the Foundations of Restaurant Management & Culinary Arts (FRMCA) textbooks which were developed and are sold by the National Restaurant Association Educational Foundation. The newest edition of the textbooks are the Second Edition which was released in 2017. For more Second Edition ProStart information CLICK HERE. PROSTART PRICE LIST CLICK HERE for the 2nd Edition Price List. REGISTER AS PROSTART INSTRUCTOR The National Restaurant Association Educational Foundation website, www.chooserestaurants.org, has features designed to make it easier to administer the ProStart exam along with resources for teaching the program. There is an online application in order to gain access to the site. CLICK HERE and follow Step One to register as a ProStart Instructor with the National Restaurant Association Educational Foundation. PROSTART COA Many post-secondary schools in the nation recognize ProStart’s Certificate of Achievement (COA), which is awarded to students who complete both levels of the program and at least 400 hours of work experience, and reward them with credit toward their degree programs. In Florida, the COA is also on the CAPE Funding list. For more information on the COA, and step-by-step instructions on how your students may earn it, CLICK HERE. ADMINISTER THE PROSTART EXAMS The COA page above also contains the link in which ProStart teachers may register as Confirmed ProStart Educators. This designation will allow you to administer the ProStart exams. SCOPE AND SEQUENCE Documents below give you a suggested timeline of when to teach the topics in ProStart and for what duration. You may tailor this to fit your needs based on your allotted class time and structure. Build your ProStart kitchen using the sample list below! PROSTART RACK CARDS Click to enlarge. Hard copies available upon request. GO PROSTART Practice quizzes may be found here for both ProStart & ServSafe. 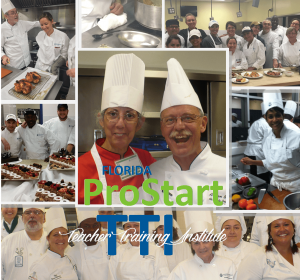 The FRLAEF makes training available for all Florida ProStart teachers. See below for the 2019 information.